Here is the new, free RE-USE Do it Yourself Agenda for 2008. For more informations about RE-USE, here. RE-USE is an ADA device (Analogical Data Accumulator) that re-uses the back of discarded photocopies or of any computer-printed document, promoting an individual behavior with an eye to the sustainability of everyday life. Follow the Re-use instructions, download Re-use files and print out your diary, the notebook and address book on the blank side of any standard-sized printed paper. You can then bind your Re-use simply with the help of a hole-punch and metal rings. RE-USE is a flexible system offering a wide range of independent inserts, all of which are available in different standard sizes: diary, notebook, pockets, address book, colorful address cards, CD holder. Makes any combination you need, and you can bind it within the original designed covers made of recycled leather. RE-USE is made of ecological materials: recycled leather for the cover and a special post-consumer processed paper called ‘cartapaglia’ for the inserts. My friend Johan tipped me for the work of Chris Jordan whose photographs visualise in clear and very understandable terms the average waste production in the USA. 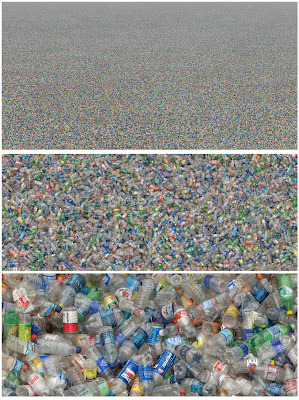 The picture above zooms in gradually on a photograph, which depicts two million plastic bottles, the number used in the USA every five minutes. Today seems to be all about numbers anyway, I found a link to this beautiful website on the weblog of Another Company. Here I’ve learned how long it takes to travel from side of the Milky Way galaxy to the other: at the speed of light (around 10 million km an hour) it will take around 100 million years! I mean, what the..? !